VANCOUVER, BRITISH COLUMBIA--(Marketwired - Feb. 18, 2015) - Graphite One Resources Inc. (TSX VENTURE:GPH)(OTCQX:GPHOF) ("Graphite One" or the "Company) is pleased to announce the results of the final ten holes of its recently completed twenty-hole diamond drill program on its Graphite Creek Project located near Nome, Alaska. The Company's quality assurance/quality control ("QA/QC") process discovered variances in the laboratory results of the first ten holes reported in its media release of December 1, 2014. It was found that there were minor differences in assay results due to equipment calibration issues. The Company is therefore releasing revised assays, using the certified reanalyses, for the analytical results of the first ten holes. "These high grade, near surface assays continue to demonstrate that the Graphite Creek Deposit stands to be the premier large flake, high grade graphite deposit in North America. The mineralization continuity is outstanding and the favourable geological structures are impressive," stated Anthony Huston, President and CEO for Graphite One Resources. 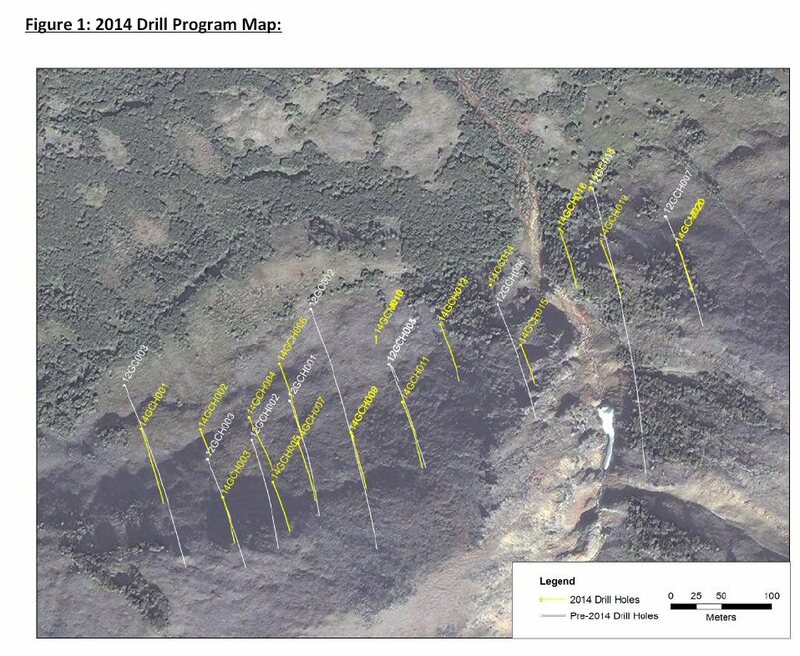 Copies of the final cross sections from the eleven section 2014 drilling program showing the drill hole geology and assays are included in the Appendix attached to this news release. Drill holes at near 50 degree dip are near true thickness intercepts. Vertical hole true thicknesses are approximately 77% of the drill hole intercept. Following a review of the QA/QC results for six of the drill holes reported in the December 1, 2014 news release, Activation Labs confirmed a calibration variance with their analytical equipment resulting in a slight error in the Cg analyses reported by the Company. Following re-assay of all of the samples and checking with a third party laboratory, the revised results were found to be within acceptable ranges for standards. The new analyses replace the initial set of assays for these holes. Table 2 below shows the certified calibrated re-analysis of the sample intervals released in December as well as the original uncalibrated results that are being replaced. The average of the differences between the revised and the original assays for all ten holes is minus 0.05%. The Company maintains a rigorous QA/QC program with respect to the preparation, shipping, analysis and checking of all samples and data from the properties. Quality control for drill programs at the Company's projects covers the complete chain of custody of samples, including verification of drill hole locations (collar surveys and down-hole directional surveys), core handling procedures (logging, sampling, sample shipping) and analytical-related work, including duplicate sampling, "check analyses" at other laboratories and the insertion of standard and blank materials. The QA/QC program also includes data verification procedures. Sample preparation and analysis for the Graphite Creek project is done at ISO/IEC 17025 accredited Activation Laboratories Ltd. of Ancaster, Ontario, Canada. All samples are assayed for graphitic carbon ("Cg"). The technique used for determining Cg is by LECO whereby the pulp is either digested with hydrochloric and perchloric acids, or subjected to a multistage furnace treatment to remove all forms of carbon with the exception of Cg. As part of the comprehensive QA/QC program, one blank was inserted into the assay stream for every 10 core samples submitted. Blanks were inserted directly after highly mineralized samples to test for contamination during the preparation. Three separate blank materials have been used and a suitable consistent material was utilized in 2014. Duplicate samples include 1/4 drill core splits and were submitted as two separate samples with consecutive sample numbers. One duplicate sample was inserted for every 20 samples. Three commercially available graphite standards were utilized in the sample stream with one inserted for each 10 core samples by Graphite One staff. These standards are an additional check on the internal standards utilized by Activation Laboratories Ltd. who provides analytical services for the core samples. Activation Laboratories Ltd. use standard quality assurance and control policies in all aspects of laboratory operations. The programs were developed from guidelines published by the International Standards Organization ("ISO") commonly referred to as ISO\IEC17025 Guidelines. Activation Laboratories Ltd. uses 5 different masses of EDTA as well as 99.9% pure graphite as internal Quality Control (QC). These are used at a 10% frequency. Activation Laboratories Ltd. also uses a 10% sample duplicate frequency. Drill hole sample rejects are routinely sent to ISO/IEC 17025 accredited SGS Lakefield and/or ACME Analytical Laboratories Ltd. for check analyses. Quality control is carried out by Graphite One. employees under the supervision of the Company's General Manager Operations, David Hembree, P.Geo. Mr. Hembree is a qualified person as described by NI 43-101 and has reviewed the scientific and technical information disclosed in this news release. Graphite One released an updated mineral resource estimate for the Graphite Creek deposit in January 2014 totaling 186.9 Million Tonnes ("Mt") of 5.5% Cg using a cut-off grade of 3%, and 95.9 Mt of 7.2% Cg at a 5% cut-off grade (see news release January 20, 2014). 3 Tonne = 1,000 kg (2,204.6 lbs). The tonnage and in situ graphite have been rounded off to the nearest hundred, and therefore may not tally due to rounding. Note 1: Mineral resources are not mineral reserves and do not have demonstrated economic viability. There is no guarantee that all or any part of the mineral resource will be converted into a mineral reserve. Note 2: The quality and grade of reported inferred resource in these estimations are uncertain in nature and there has been insufficient exploration to define these inferred resources as an indicated or measured mineral resource, and it is uncertain if further exploration will result in upgrading them to an indicated or measured resource category. Note 3: The economic viability of mineral resources may be materially affected by geology, environment, permitting, legal, title, taxation, socio-political, marketing or other relevant issues. Graphite One completed its 2014 drill program in October, with 22 holes totaling 2,297 meters, in preparation for a revised NI 43-101 compliant resource estimate expected at the end of Q1 2015. A metallurgical program was initiated in November 2014 utilizing drill core from the Graphite Creek deposit to evaluate the processing parameters of representative samples of the two upper zones of mineralization seen in the drilling. One of the goals is to optimize the process flow sheet for the potential processing facility. A completed report is expected by the end of Q1 2015 and will be incorporated into the inaugural Preliminary Economic Assessment ("PEA"). Completion of the PEA is expected in Q2 2015. The Graphite Creek Property comprises 129 claims totaling 6,799 hectares on the Seward Peninsula of Alaska, 65 kilometres north of the deep sea port at Nome. The Property is only 18km from a seasonal road and 4km from tidewater. Typically, graphite ore is processed into a size-sorted rough concentrate on site using a crushing, grinding, floatation and sieving circuit and then transported to end users as palletized material in either 20kg bags or in bulk. Mineralization at the Graphite Creek Property is characterized by coarse crystalline (large flake) graphite within graphite-bearing schist. Graphite mineralization is exposed at surface along the Kigluaik Mountain range front. The large flake graphite occurs as disseminations and high grade segregations and lenses in distinctive sillimanite-garnet-quartz-biotite schist and/or quartz-biotite schist. The host schist is continuous over 18 kilometres of strike length, based on mapping, sampling and airborne geophysics. For more information on Graphite One Resources Inc. please visit the Company's website www.GraphiteOneResources.com. This release includes certain statements that may be deemed to be forward-looking statements. All statements in this release, other than statements of historical facts that address timing of receipt of regulatory approvals, exploration drilling, exploitation activities and events or developments that the Company expects, are forward-looking statements. Forward-looking information in this news release includes statements about inferred resource estimate for the Graphite Creek Project, the potential existence and size of mineralization within the Graphite Creek Project; estimated timing and amount of future expenditures, recommendations for future work on the Graphite Creek Project, the preparation of a PEA for the Graphite Creek Project, geological interpretations and statements about Graphite One's strategy, future operations and prospects. Information concerning inferred mineral resource estimates also may be deemed to be forward-looking information in that it reflects a prediction of the mineralization that would be encountered if a mineral deposit were developed and mined. Information concerning inferred mineral resources estimates also may be deemed to be forward-looking information in that it reflects a prediction of the mineralization that would be encountered if a mineral deposit were developed and mined. Although the Company believes the expectations expressed in such forward-looking statements are based on reasonable assumptions, such statements are not guarantees of future performance and actual results or developments may differ materially from those in the forward-looking statements. Factors that could cause actual results to differ materially from those in forward-looking statements include market prices, exploitation and exploration successes, continuity of mineralization, uncertainties related to the ability to obtain necessary permits, licenses and title and delays due to third party opposition, changes in government policies regarding mining and natural resource exploration and exploitation, and continued availability of capital and financing, and general economic, market or business conditions. Readers are cautioned not to place undue reliance on this forward-looking information, which is given as of the date it is expressed in this news release, and the Company undertakes no obligation to update publicly or revise any forward-looking information, except as required by applicable securities laws. For more information on the Company, investors should review the Company's continuous disclosure filings that are available at www.sedar.com. The mineral resource estimates reported in this news release were prepared in accordance with National Instrument 43-101 Standards of Disclosure for Mineral Projects ("NI 43-101"), as required by Canadian securities regulatory authorities. For United States reporting purposes, the United States Securities and Exchange Commission ("SEC") applies different standards in the classification of mineralization. In particular, while the terms "measured," "indicated" and "inferred" mineral resources are required pursuant to NI 43-101, the SEC does not recognize such terms. Canadian standards differ significantly from the requirements of the SEC. Investors are cautioned not to assume that any part or all of the mineral deposits in these categories constitute or will ever be converted into reserves. In addition, "inferred" mineral resources have a great amount of uncertainty as to their existence and great uncertainty as to their economic and legal feasibility. It cannot be assumed that all or any part of an inferred mineral resource will ever be upgraded to a higher category. Under Canadian securities laws, issuers must not make any disclosure of results of an economic analysis that includes inferred mineral resources, except in rare cases. United States investors are advised that current mineral resources are not current reserves and do not have demonstrated economic viability. All figures are rounded to reflect the relative accuracy of the estimate and in keeping with "best practise principles".